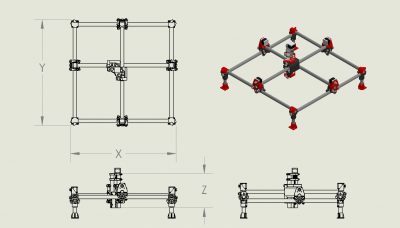 Before you start your build, you need to decide the main function of your machine will be. Yes it is, or can be, a multi-function machine but it should be sized for a specific purpose and then see what additions might be used later on. Most functions benefit greatly from having a short machine, 3D printing is the only function where a longer z axis is desired, but still is not ideal. This geometry is best with short legs and a short z axis. It was designed first and foremost as a cnc mill/router. If you think about it on those terms standard bits are no longer than 1″-1.5″ so you actually only need that much travel in the z axis, any more is just for material clearance and there are other ways to deal with that, like a drop table. Keeping a short z axis and short legs keeps the machine as rigid, accurate, and as fast as possible. This is the same for laser, drag knife, foam cutting, plotting, ect. This machine is an amazing large format 3D printer in the X and Y directions, if you need a machine for tall prints this is not the best option (can’t win em all). The maximum length for the z axis is about 12″ using a bowden style setup with the extruder mounted to the xyz piece of the gantry, 8″ max for an mk style extruder. Again shorter is more rigid, accurate, and fast. I Recommend 6″ or less. This can be a very large machine depending on your accuracy needs. Keeping the z axis short is by far the most important dimension to worry about, the longer your z axis the looser your X and Y accuracy will be due to a longer lever arm (imagine trying to sweep your floor with one hand the closer your hand is to the bristles the more accurate you will sweep). Long X and Y axis have a smaller effect on the X and Y accuracy but will have a larger effect on the Z accuracy due to long rail flex in the Z direction. For example if you wanted a half sheet wood router you will be fine if your cuts are 2D cuts all the way through, to compensate for any loss in Z accuracy just cut a bit deeper . You can go even bigger if you keep this in mind and use mid span support on the outer rails to supplement the rigidity. Anything over 3.5′ or so and you should really have a look at the LowRider CNC. 2’x2′ is a really fun and easy to use machine, anything larger and your CAM will have to be very accurate to work well.